How to sew curtains is an easy project for the beginner. The tailored curtains are very popular and a nice way to cover a window. These will make easy sewing projects and you do not need curtain patterns to make them. Ready made curtains can be very expensive and often the color or designs may not be what you want to use to match with your decor. Tailored curtains are suitable for just about any room of the house. You can also use almost any fabric to make them. From sheerest fabrics to heavy materials they will all make up well into tailored curtains. As noted above you do not need a curtain pattern to make these. You will need to measure your window and go from there. 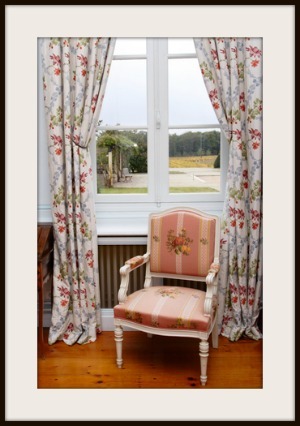 Each curtain panel can be made from the full width of the fabric , which is usually 44 to 45 inches. The length is a matter of taste. You may want the curtain to reach the window sill, the baseboard or go all the way to the floor. What ever length you desire you must remember to add more for the hem and rod sleeve. It is a good idea to take your measurements with the rod in place. Laying your fabric flat, measure off the measurement you decided on adding about 8 inches to each panel for a hem and the top allowance. This is the length you will cut. First you will want to sew the side hems. The side hems are usually 1 to 1 1/2 inches wide. Hem side full length on each side of panel. For the bottom hem if using the sheer fabrics you will want to make the hems about 2 ½ to 3 inches. The heavier fabrics could be as much as 8 inch hems. NOTE Always remember to back stitch on the ends to strengthen the seam. At each end of the hem turn the curtain around and stitch back about 1 inch or so over the first stitching. This will strengthen the hem and seams from pushing in the rod. Now how to sew curtains top hem. For the top hem and rod pocket you will want to turn it down at the dept you decided on. 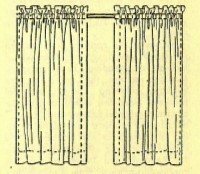 Say 1 or 2 inches for the hem plus you will need to allow an additional 2 inches, and stitch the top hem of the curtain. Now make a second stitching at the measurement you want the heading to begin. Finish the ends of each row of stitching as noted to strengthen. Slip the curtain rod through the lower part of the divided hem and adjust gathers evenly. Note: If you slip a piece of paper or fabric over the end of the rod, it will slip through the hem easily.